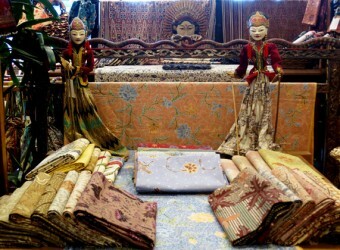 Bali Souvenior Shop An antique Batik shop, Pithecan Thropus has various kinds of Batik from reasonable ones. They are popular as a souvenir of Bali. The Asian taste of the designs will be a good accent of your fashion style! They have 2 shops: Ubud and Legian. Why don't you take a moment to find your taste of batik? I personally like this shop. I buy batik every time I go to Bali. Pithecanthropus sells antique batik. It`s good that it`s located in Legian Street, I didn`t have to go to Ubud. Next time I`ll try to go to its main shop.